via Pave more roads or free bikes? Stimulus for the future. 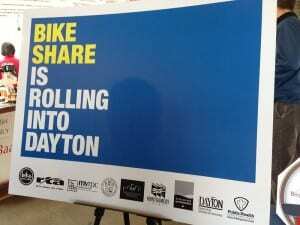 5 years later- Bike share announced. Up until then- talk of bicycling in Dayton was mostly revolving around our amazing bike path system and a mountain bike course as part of Five Rivers Metroparks. Andy Williamson was organizing the first bicycle summit- which was held in August ’09. I made arrangements for Bcycle to bring one of their prototype bikes and give a presentation. Most people looked at that 35-pound bike like an albatross. I saw beauty. This isn’t a bike for sport riding- or for a daily commute- this is a “magic bike” that’s there anytime you need a bike. I started making the rounds explaining how the system works and what the advantage would be. I sat with Dr. Ervin and gave him a rundown. I made presentations at World Usability Day- and shared the idea with university presidents and anyone else who would listen. Today at 10 a.m., Mike Ervin, Sandy Gudorf, Andy Williamson and Scott Murphy as well as Mark Donaghy of RTA all stood up at the 2nd Street Market and announced that next year, 6 years after my first post- that we’d see 22 bike stations with approximately 200 bikes hit the streets downtown. No vendor has yet been selected. There is a million dollars available from the Federal Highway Administration- and the City of Dayton is kicking in $250K according to Mayor “I never miss a photo opp” Whaley. RTA will manage the maintenance, operation and distribution of the bikes. Details on pricing aren’t available yet. No word on the name of the system or if any major backers are buying naming rights. To me, this is a no-brainer sponsorship for one of our two health-care duopolies- but, who am I to suggest where you waste your millions in marketing dollars? I once built an interactive map on Google Maps- and using a multi-site system- where there are distributed nodes- not continuous coverage- for places like the Dayton Mall/Austin Landing area, WSU/WPAFB/Fairfield Commons mall etc- I came up with a need for at least 100 stations and 1,500 bikes. 22 stations and 200 bikes is a start. It’s a very good day for Dayton, with this announcement and the Flyers advancing to the Elite 8 to face Florida tomorrow night. Next Post: How about billing UD for riots? False alarms are not the big problem. Another Esrati idea In the span of what? A month? First the City adopts the Hoops Dayton initiative. Now we are implementing bike share. Quite a list of accomplishment for never being elected! Yes, our Esrati is the best person the Dayton/Miami Valley Region has who has a consistent, steady output of visionary ideas, investigative reporting that exposes the local scoundrels (with the facts to back him up ) and for whom NO credit is given. What a dern pity. Better late than never! Congrats, David….As far as I’m concerned you are the one who introduced the concept to this area (I, who is usually up on stuff like this, never even heard of bikeshare until you posted about the idea). So, good on ya, dude!